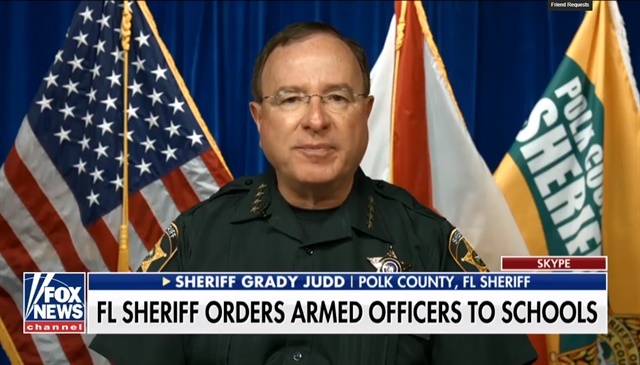 Polk County, FL, Sheriff Grady Judd called an emergency meeting with police chiefs across the county after last week's shooting at a high school in Texas, resolving to make sure every school has an armed officer. "The children are worth it," he said on "Fox & Friends" Tuesday, reports Fox News. Last week's shooting at Santa Fe High School left 10 dead and another 10 injured just a few months after a former student killed 17 people at Marjory Stoneman Douglas High School in Parkland, FL. Judd said that Florida legislators provided funding for school resource officers (SRO) and what are calledSafe School Guardians.